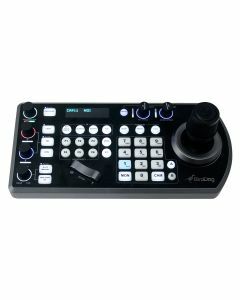 BirdDog PTZ Keyboard is a full featured PTZ Keyboard that supports NDI, NDI|HX, Visca over IP, RS422, and RS232. Never before has a PTZ controller been so flexible. PTZ Keyboard is the world’s first PTZ controller with NDI and NDI|HX support. Along with NDI there is support for Visca over IP, RS422, and RS232. Super flexible powering options allow you to power the PTZ Keyboard from Power over Ethernet (PoE), DC in, or even over the serial port. Never get stuck in a situation where you can’t power up. PTZ Keyboard is the world’s first PTZ controller with Audio Intercom support over NDI. PTZ Keyvboard is compatible with BirdDog Comms. Comms is a complete Audio Intercom solution which can run on any Windows 10 compatible computer, laptop, or surface for a touch screen experience.